Slip through the veil and enter Paulina Cassidy’s dreamy, faerie-flecked world for a while. Fifteen atmospheric pieces that straddle the boundaries of ambient and dream pop wait for you here, with soft vocals chanting beneath heavy layers of echo and effect. Flitting by in just under an hour, Sugar Wingshiver‘s individual tracks offer brief visions, but they’re fully formed and engaging. While I don’t normally review lyric-based releases, Cassidy’s breathy delivery and deep treatments of her words, on most tracks, render them down into less distinct melodic elements–instrument rather than word. As she sighs through “Luna Sea,” I know there’s a story being told but it’s more about the way the cadence of her voice melts into the slow-moving song under them. (The inside of the CD cover offers the lyrics.) In places, however, the story does take the forefront, as with the pairing of “Voodoo Lily” and “Loup Garou.” Snaky bass and heavy echo bring Lily’s story to life; “Loup Garou” stalks through a misty landscape with a distinct feeling of mystery and moonlight. It’s one of the best examples of what Cassidy is doing with the music here, building it largely on a backdrop of soft washes and grounding it with tapping hand percussion. “Bird On A Mission” uses this, along with short phrasing on the low end of the piano, and ties into into rhyming wordplay. Cassidy varies the approach in places with purely instrumental cuts, like the beautiful and too short ballad “In A Labyrinth of Light.” “Fire In Our Eyes” render the artist’s voice into sighs and cries and underscores them with a pulsing beat and stuttering electronics. 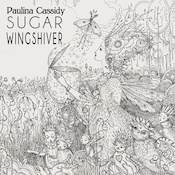 Sugar Wingshiver is another excellent release from this unique artist. Take this journey.